Not a true arch; the appearance of an arch is made by advancing a series of corbels from each side until they reach the middle. 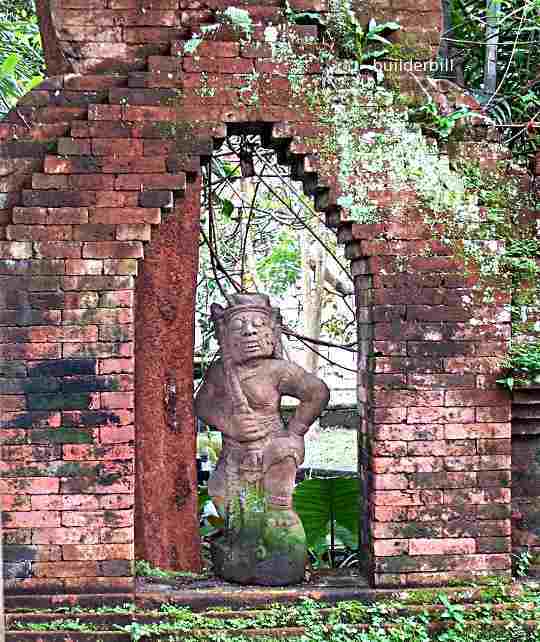 A visitor to the ancient Khmer temples in Northern Cambodia will see many arches built like this one. 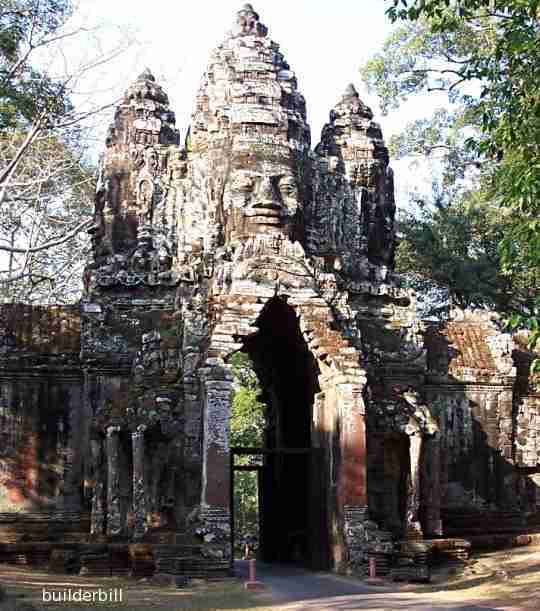 It is a gateway to the last of the great cities of the area, Angkor Thom. Built towards the end of the 12th century it covers a huge area and it is mind boggling to try to imagine it in it's heyday. While not being as structurally sound as a true arch they have been built by the ancient Greeks, the Mayans and many other ancient cultures. The so called arch relies on either using long masonry units with comparatively small overlaps or a huge amount of heavy material above it to keep it stable. The reason why so many of the Khmer arches and vaults have failed is that like the gateway above, they did not have that stabilising weight, and they did not use any mortar to help to bind them together. The previous page shows the effectiveness of corbelled structures up to a certain size of course, compared to the mass of the rest of the structure. 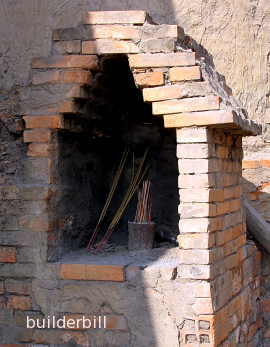 The photo on the right (taken in 2009) is of a small arch attached to a much larger arched structure, a beehive type brick kiln in modern Vietnam. These structures are still being used and rebuilt as they decay, in exactly the same way that they did when Angkor Thom was built. Any type of masonry can be used to build a corbel arch and it can be made to look quite similar to a true arch by shaping the inside faces of the corbels, but in reality they are rarely used nowadays as there are better ways of doing it. The arch above is in a temple complex in Ubud, Bali and I am not too sure how old it is. Probably if and when the Balinese build a new place of worship I feel sure that they would still build in this age old style that came to Indonesia with Hinduism from India. 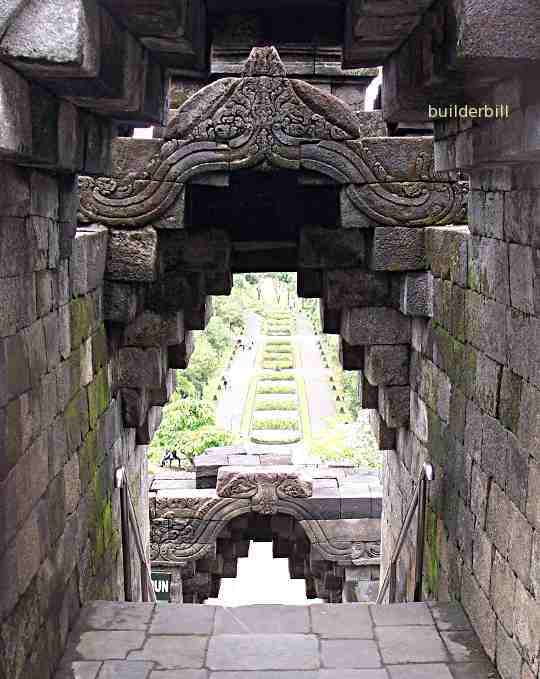 Staying in Indonesia here we see a couple of corbelled arches at the world heritage temple complex of Borobodur in central Java. An interesting feature of these arches are the "T" shaped keystones. Once again showing the Hindu influence.